Buckle Up, Mississippi. Seat Belts Save Lives | Merkel & Cocke, P.A. The most dangerous thing you will do in your life, you probably do every single day without thinking about it. It is getting behind the wheel of your car. Likely the most dangerous thing your child will do is ride as a passenger in a motor vehicle, especially if they live in Mississippi, where more children die in car crashes each year per capita. Mississippi also has the highest percentage of child fatalities in the U.S. who were not properly restrained. Motor vehicle crashes are a leading cause of death for those between the ages of 1-54 in the U.S. per the Centers for Disease Control and Prevention (CDC). The CDC reports that although seat belt use is one of the most effective ways to save lives and reduce injuries in crashes for adults and older children who fit in seat belts properly, millions of drivers and passengers do not buckle their seat belts on every trip in the car. The Mississippi Department of Transportation (MDOT) reports that 77.9% of Mississippians use seat belts as compared to 90.1% of the rest of Americans who use seat belts. Nationwide, seat belts saved 13,941 lives of people over age 5. Child restraints saved 266 children ages four and younger. Seat belts saved 296 lives in Mississippi in 2015. If everyone buckled their seat belts, another 121 lives would have been saved. 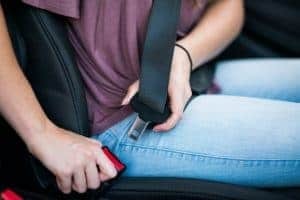 Will the new seat belt law in Mississippi save lives? On July 1, 2017, a new seat belt law became effective in Mississippi. Now, every passenger in the vehicle must be restrained by a seat belt. The old law required only front seat passengers and children under a certain weight limit to be restrained. Drivers can now receive a $25 fine for every unrestrained passenger in their vehicle. Law enforcement officers also have the discretion to issue tickets to drivers for allowing passengers to ride in the back of pickup trucks. The new law, called Harlie’s Law, is named in memory of a 15-year-old student who was killed in a car accident in November 2016 while riding in the back seat of a car. The research study in the Journal of Pediatrics draws a correlation between the fatality rate of unrestrained children and seat belt laws. The percentage of children who died in traffic crashes who were unrestrained or inappropriately restrained was 38% in Mississippi, where there was no law requiring back seat passenger to wear seat belts and 2% in New Hampshire, which has a seat belt law for children under age 18 (although there is no legal requirement for adults to use seat belts in NH). If you want to make sure that your children are as safe as possible in your vehicle, you can visit Safe Kids Mississippi, which provides car-seat inspections to make sure that your child safety restraints are appropriate to the height and weight of your child, and safety workshops. Make sure children are properly buckled up in a car seat, booster seat, or seat belt, whichever is appropriate for their age, height, and weight. Have all children age 12 and under sit properly buckled in the back seat. Remember to never place a rear-facing child safety seat in front of an air bag. Properly buckle children in the middle back seat when possible because it is the safest spot in the vehicle. Mississippi State University also publishes car seat safety tips to help you choose the right car seat for your child. The skilled Mississippi car accident attorneys at Merkel & Cocke are here to answer any questions you might have about your legal options after you or a loved one has been injured in a car crash. We have offices in Jackson and Clarksdale, but we also serve injured clients in and throughout Tupelo, the Gulf Coast Region, Tennessee and Arkansas. You are welcome to call us today at 662-799-1633 or complete our contact form to schedule a free consultation.